On August 8, 2010, I published my first blog post from South Africa. The first photo in that post was a picture of a hadeda in my back yard. A hadeda at the Lucky 5 Star — my first South African blog photo. I’ve mentioned hadedas in passing over the years but I’ve never devoted a blog post to them. This is inexcusable, I now realize. 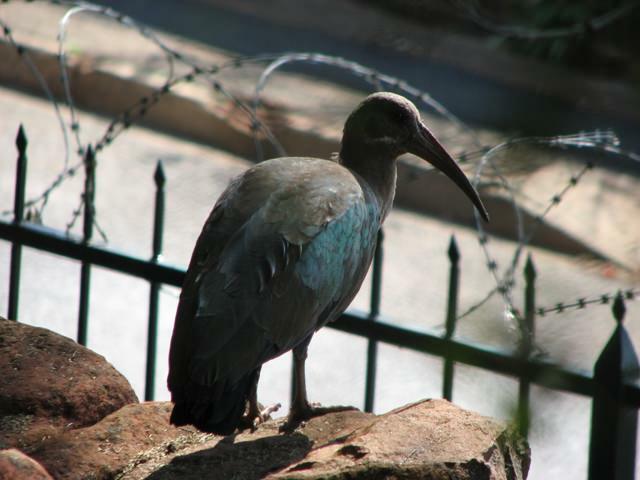 The hadeda is more than a bird; it’s a Joburg icon. If you live in Joburg — whether it be in Melville or Mondeor, Sandton or Soweto — you probably awaken to hadedas every single morning of your life. You might love them, you might hate them, or you might have become immune to them. But the hadeda is always hovering on the edge of your subconscious, standing silently a few feet away or scaring the crap out of you as it launches into the air with a deafening screech. The hadeda (pronounced HAH-dee-dah, scientific name Bostrychia hagedash) is a large ibis, recognizable by its long beak and clumsy demeanor. Hadedas live all over sub-Saharan Africa, mostly in grasslands. But they have adapted exceptionally well to cities and especially to Joburg. I met this hadeda earlier in the week at the Rietfontein Nature Reserve in Paulshof. He caught my eye because he is particularly large. While hadedas have a striking appearance, they are known more for how they sound than how they look. Hadedas are notorious for waking up well before the sun and piercing the dawn with shrieks as they take off from their evening roosts. You can read about hadedas on Wikipedia but the entry doesn’t do them justice. If you want to understand what hadedas are about, watch this nine-minute documentary on YouTube. The South Africans among you should watch too, if you haven’t already. It captures the spirit of the hadeda. There’s a reason why I was suddenly inspired to blog about hadedas today. I’ve been working with my friend Fiver Löcker to develop a new blog header, which is nearly done. Fiver has a knack for drawing on her iPad and she has created a sketch illustrating various aspects of my life in Joburg. I don’t want to give too much away; the sketch is being finalized and I’ll publish it on the blog next week. The 2Summers hadeda, created by Fiver. I think it’s the most beautiful bird in the world. The hadeda features in my new blog header. Come to think of it, I’m a lot like a hadeda. I’m not originally from Joburg but I’ve adapted well here. There are plenty of other places I could live but I’ve made this city my home, for mysterious reasons that I myself do not fully understand. Wow, that’s deep. I typed that paragraph before I even thought it. I’m looking forward to your new header. I live in South Florida. Even before I read further into your blog describing the bird more fully, I recognized this bird as an Ibis. I have Ibises – white ones – in my backyard and around my neighborhood. These are quiet birds, except, if I pass a large group of them, I can hear some kind of a low murmuring. Your Hadeda is lovely. Thanks so much. I’m familiar with the ibis in the southern U.S. (my mom has lived in Florida and South Carolina) and we have white ibises in South Africa too. But you’re right — none of the other ones make much sound. The hadeda is unique in that way. I’m really looking forward to the new header too. This one has gotten very stale. It’s been too long since I gave the blog a makeover. Hmm. I don’t think that’s the right analogy. Raccoons don’t make much noise, although they can be aggressive if they get into your trash can at night. I can’t really think of a North American animal that’s comparable to the hadeda. I love it! It’s funny, I blogged about the hadeda a long time ago and used that same video clip, it’s just so funny. I also love the blog header hadeda, can’t wait to see the whole thing revealed! Yes, I vaguely remembered that you also wrote a hadeda post. That video is the best. Harry the Hungry Hadeda is now stuck in my head! And I really really want a hadeda ringtone. I also want a hadeda ringtone. let me know if you find one!! OMG. I’m going to do this too. Well, lah-de-dah! Isn’t he something! They remind me of the pigeons of American cities, except the pigeons arrived with a meek “coo” and now the carbon monoxide has strangled them to a kind of “glurgle”. And the hadeda looks cleaner. Yes, I think hadeda a are cleaner. There aren’t quite do many of them so they have less competition. We have hordes of pigeons in Joburg, too. …and they eat Parktown Prawns! Incredible is a very good description. 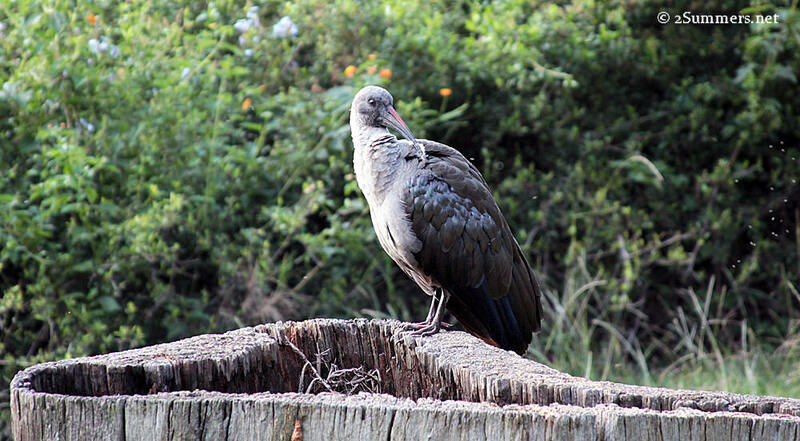 I`m obviously behind in my bird watching- the pic I saw on Instagram I thought was the Dodo. I continued to read of course….. Love the direction your heading is going in! lve lived in Joburg and truely I have become emune they just amaze me with their beautiful colours now I am just mesmeised by their natural beauty . You need to spend some time in Howick, KZN if you love Hadeda’s so much. I personally can’t wait for the day they come off the protected species list. My shotgun is loaded and ready. What is the collective noun for a number of hadeda’s, is it a flock as for other birds. Hmm, I’m not sure! I’m assuming it’s a flock but don’t quote me on that. Rumour has it hadedas screech on take off and in flight because their voice box is connected to their wings as reminder to flap those wings otherwise….!!! They never make a sound on the ground! Hahaha! I don’t think that’s true though. It’s rare, but I’m pretty sure I’ve seen hadedas make noise while walking.